December is the last chance to dance with the tasty grouper for the 2012 season. On January 1, grouper season is shut down again for the entire months of January, February, March, and April. By the way, do not let anyone try to convince you that we can fish the shorter closed season from Gulf of Mexico waters. 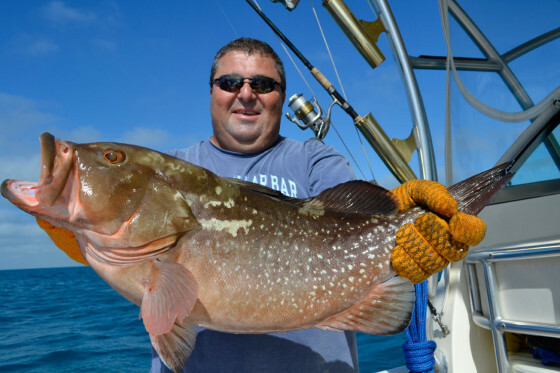 Monroe County anglers are not allowed to land grouper caught in the Gulf in the Keys. Those closed months of course, also coincide with your best chance of encountering said critters on our shallow patch reefs. So at least for the remainder of this year it pays to keep stocked up on pinfish, ballyhoo and deep diving plugs. Being afflicted with fishing ADD as I am, keeping occupied for the rest of the day after catching my limit of grouper is not a matter of if I can, but of what I want to concentrate on. There are plenty of opportunities out there to take up the remainder of the day. If the fishing gods have been kind while anchored up on the patches, getting the morning’s fill of grouper and snapper; a school of ballyhoo will have found their way into castnet range. So with the bait well full of live ballyhoo there is little doubt that slow trolling live ballyhoo for a sail or two is next on the agenda. Of course sailfish is not the only thing you may encounter while working live bait outside of the reef line. There are going to be opportunities to catch dolphin, tuna and all types of mackerel. 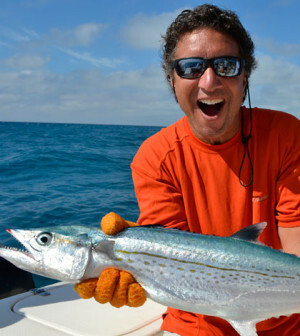 The mackerel including king, cero, Spanish, and wahoo are likely to help themselves to the ballyhoo, without bothering to attach themselves to your hook. It pays to check your bait often. You might find that you have been dragging a half fish around behind the boat- if you were lucky. If not, you may have been just dragging a hook-less leader. If you are getting cut off you can bridle the baits on a wire leader to get a few fish to the boat. Of course this will cut down on, if not eliminate strikes from more observant critters such as the sailfish and tuna. From my departure point, working my way west keeps the boat in the troughs on the north wind and gives a tail sea on the east wind serving to give a quiet ride which will eventually put me in the vicinity of some of the deep oceanside wrecks. Dropping vertical jigs for blackfin tuna, amberjack, Almaco or mutton snapper serves to round out the days catch. If you are careful, you can keep your live ballyhoo in the water while drifting the wrecks and not miss out on an opportunity for a pelagic predator finding a snack on the surface. As I have mentioned in previous articles, this is all brought to you courtesy of the letter N. As in ”winds out of the north”. Most, if not all, of our winter reef and offshore fishing is enhanced, if not dependent upon, bait fish such as the pilchards and ballyhoo being blown out to and over the reef line by the prevailing north winds after the cold fronts. While it can certainly get a bit choppy after the passing of a front, it pays to know the capabilities of both your boat and its crew. It is a shame to sit at the dock when it may not be as rough as you might have been lead to believe. Due to protection from the shore, the fetch of the wind is so short that seas often do not have a chance to build to the stated heights in the marine weather report. The north wind tends to supply winter residents both on land and in the water.